Mardi Gras Marching Krewes – how you can join the fun! Thought about joining a krewe? Get the scoop as others thought the same, joined and love it. Let’s peek inside and meet some of the masked revelers. Taylor Galyean is one of five board members with the Laissez Boys, his sixth year in the seven year history of the group. 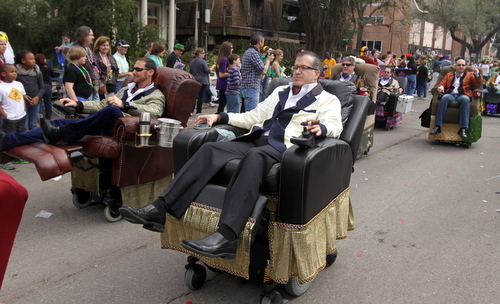 It’s a jolly krewe that enjoys strolling the parade route in the comfort of their recliners. There’s really no hierarchy, no formal rolling of the recliners. The electric-powered chairs are styled by each member, jazzed up with lamps, an ice chest or whatever fits their style. 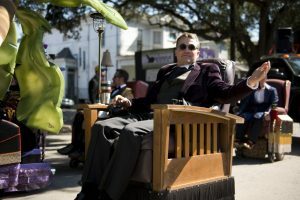 The Laissez Boys roll in two parades, Muses and Tucks, and they meet two to three times a year for social events outside of the parades. Each BDL wears custom face painting, reflective of her Baby Doll Lady nickname, which is usually assigned upon induction into the group. The members do all of the designs and face painting. Besides the numerous hours of dance practice, workouts, costume fittings and dancing through the streets of New Orleans, Louis admits the best part is the sisterhood. While some of us transform into a tutu butterfly princess, others seek comic book characters. The Chewbacchus krewe and its subkrewes meander across the Marigny on a mission to save the galaxy; one drunken nerd at a time. 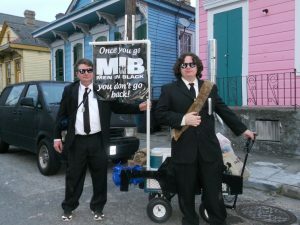 Elden Spear otherwise known as Agent El, and his son, Arlo, formed the Men in Black, a subkrewe of the mothership in 2013. Spear and Heather Ruoss are the capos (captains) and work together to make throws and parade drinks. 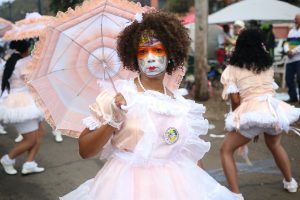 Besides the outlandish costumes, the Chewbacchus krewe comes up with some catchy themes each year including one year where they became a religion. “That got some national and worldwide attention; there were press clippings from London, and we were mentioned in a newscast from Indonesia,” says Spear. The Ritmeaux Krewe, founded in 2016 by Bianca San Martin, is focused on promoting Hispanic/Latino heritage through Latin dance and music. Bianca’s mother, Eva Hurst, joined the krewe, and at the age of 60, she is a chaperone, water girl, and an important member of the spirit squad. 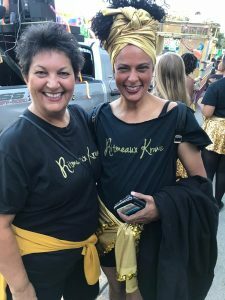 More than a Mardi Gras walking krewe, Ritmeaux is a support group, practicing recovery through bonding, along with exercise and social activities. Hurst knows this first and as she’s also a cancer survivor. One of her fondest moments of the parade is watching the crowd’s reaction. Hurst was looking for a cancer support group, and she found the Amazons krewe created by Dianne Honoré. Seen here in the photo, both have battled cancer, and both are dedicated to winning and helping others. The Amazons were founded in 2012 after Honoré was diagnosed with breast cancer. In her battle, she found so many courageous, giving people that she decided to bring them all together to help others. Fearless, the Amazons see themselves as a service group and then as a marching troupe; a symbol of hope. They take it to the streets during Carnival dressed in custom designed breastplates with shields and swords. 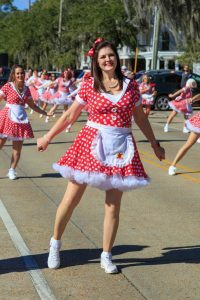 They march in the Joan of Arc and Femme Fatale parades, and in February 2018 became the first group founded by and in support of cancer patients to host their own Lundi Gras parade through the streets of New Orleans. Dressed in fluffy polka-dot skirts, pearls and aprons, the Mande Milkshakers harken back to an era of gathering at the soda shop sipping on milkshakes. The first women’s marching group in St. Tammany Parish, Tina Rhinehart formed the group in 2016 dedicated to raising funds for nonprofits. Melissa Serpas joined the sixty-one-member group in January 2017 and admits the crowed enthusiasm is off the charts. The krewe marches year-round. They plan custom routines for each holiday parade along with special events. Following the group’s Four Pillars—fun, fitness, friendship and philanthropy, Serpas admits the Mande friendships will last a lifetime. Of course this is only a smidgen of the fun and fantasy that makes Mardi Gras so special. Why not join the fun, put on your dancing shoes, shimmy to the front and get down with the dancing krewes. Or better yet, check out the krewe tryouts– most are listed on their websites. Deborah Burst is a local author, speaker and award-winning travel and lifestyle journalist/photographer. She is also co-founder of the Northshore Literary Society and a regular contributor to our publications.